President Abdulla Yameen Abdul Gayoom has launched the National Strategic Plan to end TB in Maldives. 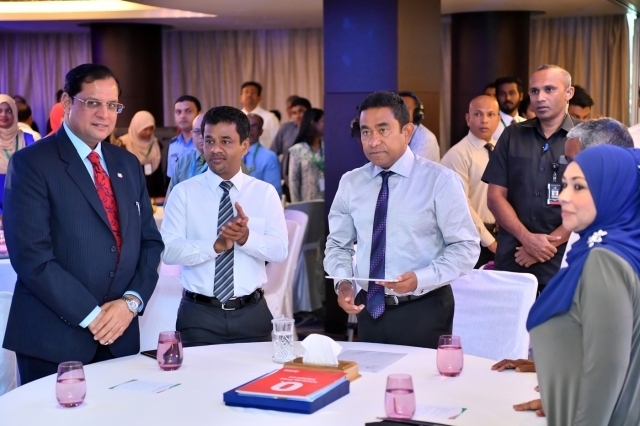 The MVR 170 million (USD 11 million) Plan was launched in a function held at Hotel Jen this Thursday morning. The Plan was launched to eradicate tuberculosis from Maldives within the next five years, and to make Maldives the first South East Asian country to eradicate TB. TB was classified as a serious disease in Maldives in 1960. Maldives has been running campaigns to eradicate the disease from the country since then. The Ministry of Health aims to lower the TB indicator rate by 50 percent, and lower the mortality rate from TB by 75 percent in 2022, compared to 2017. Speaking at the launch of the Plan this Thursday, World Health organization (WHO)’s resident representative to Maldives, Dr. Arvind Mathur said Maldives was the first South East Asian country to launch a national strategic plan to eradicate TB. He said the South East Asian region had the highest TB rate, and that governments spent millions of dollars on the disease each year. “The lives of 53 million people have been saved in the efforts to eradicate TB within the last 16 years. That’s 6 lives per minute,” said Mathur. Mathur said 150 – 200 new cases of TB appear each year. He stressed the need to do more in order to eradicate the disease. Mathur reiterated WHO’s cooperation in the efforts by Maldivian government to eradicate TB from the country. He noted the success by Maldives in eradicating filariasis, malaria and small pox from the country. And expressed his confidence in the success of the Plan to eradicate TB. Mathur noted that Aasandha health insurance services available for TB treatment, and said every USD 1 invested in the fight against TB will earn a return of USD 43. Maldives was the first South East Asian country to achieve the regional target to control TB.